The Nikon AF-P DX NIKKOR 70-300mm Lens is designed for Universal and Nikon cameras. This compact digital lens is lightweight, extremely fast and nearly silent, and offers users a maximum focal length of 300mm and a 70mm minimum focal length. With its powerful zoom, this product can bring distant objects into focus and users are assured of vibrant colors, deep contrast, and minimal distortion on their photos and videos. Well made, as described, fast shipping!! Fast service, product looks great. as described, quick shipping, good seller! Great item, good price, fast shipping. Great ebay seller! Excellent transaction. Super fast shipping Thanks! Thanks great product and fast shipping. Great communication!!!!! 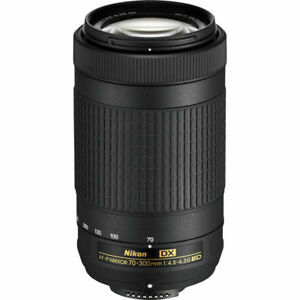 The Nikon AF-P 70-300mm NON VR tele zoom lens is a good lens for entry to mid level photographers. The plastic seems to be durable and the optics quality seem decent. The zoom ring does not bind when zooming. There is some friction, but then this is an entry level lens. The manual focus worked well for me. There is no external Manual Focus switch on the body of the lens. The trick to using manual focus with this lens is to set the manual focus mode on the camera, half press the shutter release button, and then turn the focus ring. Once what you want to focus is in focus, then press the shutter release button all the way. Since this lens is NON VR, I recommend you either shoot with a tripod or shot at speeds appropriate for your focal length. This length of this lens when retracted is 8 inches. It's about 2/3 the weight of a 16oz bottle of water. The girth of the lens is about the same size as the bottle of water. This make the lens easy to carry around all day. In the attached image, you can see the hairs around the deer's eyes and the reflection off it's eyeballs. The exposure was: manual focus, 200mm, f5.6, 1/200 sec. I did not record the ISO, but was likely at ISO 800. The bokeh was surprisingly good. Won't focus at all on D800, D800E, D700, D610, D600, D300s, D300, D200, D90, D80, D70, D70s, D50, D100, D7000, D1, D2, D3 or D4 series, D5200, D5100, D5000, D3200, D3100, D3000, D60, D40 or D40x. So, if you plan to use one of the above-mentioned cameras, DO NOT BUY THIS LENS! Otherwise, this is a great deal. Great all around zoom lens. Great lens. Lightweight with good reach. Only issue I see with it is that it only goes from 70 to 300mm. This means that in addition to your 18-55 mm lens, you need to carry one more that will cover the gap between 55 mm and 70 mm where the zoom starts. Not that big a deal, but I wish it went from 55 mm to 300, instead. It is not a VR lens. I love my Nikon AF-P Nikkor 70-300mm Lens. The lens gives great sharpness and detail and has great functionality all the way around. It is somewhat lightweight and it eliminates some camera shake. The 58 mm telephoto lens gives a white cloudy vignetting around the edges of the picture while focusing on the main object in the center. it gives a really cool abstract image. I haven't utilized the macro lens yet. The Polarizing lens is a great addition as well as the 3 additional color lenses. A great price. Im very happy with my products. tack sharp - corner to corner - even at 300 mm. FAST Auto-focus with AF-P. Light enough to easily hand-hold. VR brings that f/4.5 down to the equivalent of f/2 ... NICE. All this for a reasonable sum - RECOMMENDED.